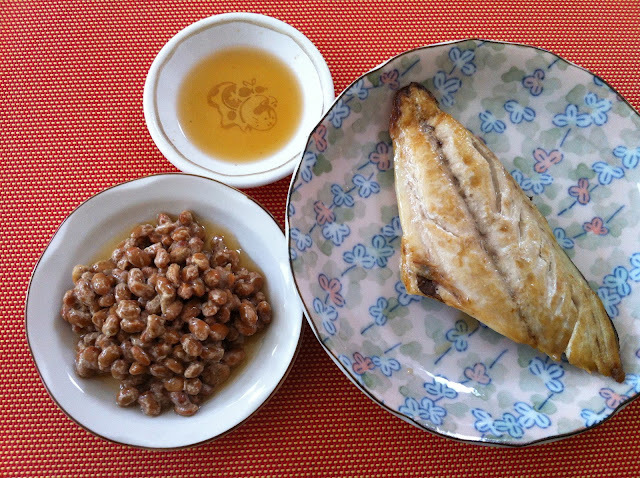 natto & grilled saba | what is clara eating today? Natto is japanese fermented soybeans… it has strong smell and flavor, so it definitely is an acquired taste… but clara and my husband loves it. Saba is japanese name for mackerel. All the ingredients can be purchased at a japanese market. 1/2pack (22g) Natto (Azuma Organic) – If natto is frozen, leave it out on the counter for about an hour to defrost, or leave it in the refrigerator the night before. Mix natto with sesame oil. It is ready to be served! Wash mackerel in cold water and pat dry with paper towel. sprinkle a pinch of salt to season lightly. Heat a grill pan in medium heat. Spread Canola oil and grill the mackerel until it is cooked through but not dry, about 4-5 minutes on each side. Serve with 1T(14g) of sesame oil mixed with salt as dipping sauce.